This is only my third time reading The Horse and His Boy , the last time being in 2008! The reason for this is that I have long held to the belief that this story is my least favorite in the Narnia series. However, I am reading through the series with my kids and this was the next title up. With a groan (truly) I pulled it from the shelves and braced myself to re-read it. And oh how glad I am that I did! This time, the story spoke loudly to me. I am grinning at myself over my about-face when it comes to this book. As I said, the last time I read this book was in 2008. Life presented one of its hardest challenges to us in 2009 (worst year ever) and although many of the issues have resolved themselves since that time, 2009 will always be impressed upon our memories as being used by God to shake us up and shake us out of some bad situations and some bad attitudes. Enter: The Horse and His Boy . This title is all about challenges and how God uses things, people, and situations (which might look awful to us) to bring about good. He uses the "bad" in our lives to change us and to make us into the people He wants us to be and that is what all of the characters in this particular Narnian story happen to learn. Fourteen years into the Pevansies' reign as kings and queens in Narnia, in the southern land of Calormen, a boy named Shasta lives with an old fisherman whom he believes to be his father. Shasta and his "father" take in a nobleman (a Tarkaan) for a night's stay and in eavesdropping on a conversation between the fisherman and Tarkaan, Shasta discovers that the fisherman is not really his father. 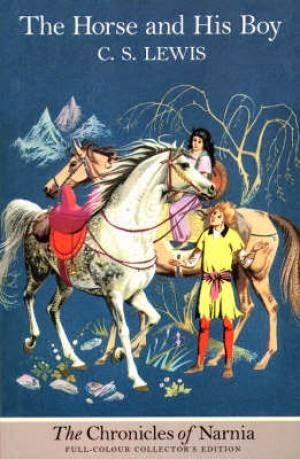 Shasta discovers two additional things: 1. the nobleman's horse is a talking Narnian horse; and 2. Shasta himself is of northern descent. The horse, Bree, and Shasta agree to run away together, "To Narnia and the north!" Along the way they meet up with the high-spirited Aravis and her talking horse, Hwin. The four join forces and commit to traveling to Narnia together. To get there, they must cross a huge dessert and high mountains. The foursome also must outrun their enemies and give warning to Archenland and Narnia of an impending attack by the Calormens. It is quite the adventure story, full of difficulties which must be overcome. The book starts out quite slow though, with Lewis trying to incorporate archaic language. There is (in my ever so humble estimation) an overuse of the words "thee" and "thou" which I could do without. The vocabulary was a bit confusing and I think the first few chapters of the story rather flew over the heads of my kids. I honestly don't know that they got anything out of the first part of the book. All the while, I was regretting the read and wishing that I was entering the wardrobe again instead of crossing the desert. But a book series is a book series and you can't skip parts or you'll miss important things. So we pressed on! When we'd reached the middle of the book things started to pick up for all of us. Lewis fell into his "usual" Narnia writing style and began using words and language patterns which make sense to our modern ears. That allowed us all to begin engaging with the story a bit more. By the end of the book I found myself in a flood of tears, just as I usually do when I'm in Narnia. I realized that I loved this book just as much as the others. I might even appreciate it more than some of the others in the series for the message which combines struggle and hope for the victory. Shasta and Bree are conversing and Bree fails to show verbal honor to the leader of the Calormen. "I say," put in Shasta in a rather shocked voice, "oughtn't you to say 'May he live forever'?" "Why?" asked the Horse. "I'm a free Narnian. And why should I talk slaves' and fools' talk? I don't want him to live forever, and I know he's not going to live forever whether I want him to or not. And I can see you're from the free north too. No more of this southern jargon between you and me!" ". . . [I]f Bree had had a Tarkaan on his back at that moment to make him go on, he would have found that he was good for several hours hard going. But one of the worst results of being a slave and being forced to do things is that when there is no-one to force you any more you find you have almost lost the power of forcing yourself." I made mental note to apply this idea of training a person to disciple themselves (as opposed to training them to obey you always) to parenting. You, as a parent, have an obligation to train your child to be a disciplined, hard working sort. However, you can't and shouldn't have to stand by for their entire lives making sure they keep getting out of bed in the morning, keep putting their feet on the floor and keep committing to do right. We, as parents, don't want to raise slaves. I want free-thinkers who are self-disciplined and ready to throw themselves joyfully into whatever God has for them. This passage was a good reminder to me to focus on teaching my kids to self-manage and do right whether I am looking their direction or not. Every time I read that my heart swells and I'm not yet sure how to put my thoughts and feelings into words. All I know to say is, "My sentiments exactly." Whether I live or die, I am the Lord's. In rich or in want, I am the Lord's. Everything I have is His and He can eat me if He wants. Every year of my life could be a repeat of 2009 and I would still be the Lord's. He has never left me or forsaken me. He has changed me with lion claw scratches on my back, but He did it for my good. I can run a little faster now, thanks to those scratches. Any scars are alright. They are His motivating gift to me. To put that another way, I'm most definitely for Aslan, even if there isn't any Aslan. Great post! We're about three or four chapters in, and so far everyone's enjoying it. Love your thoughts. : ) I love how we can all read the same book and come away with completely different (yet complementary) deep truths that minister to us. I found I loved this one more as an adult because of those themes than I did as a kid. In fact, my reaction pretty much parallels yours. I enjoyed revisiting the story through your post. I remember not liking it quite as well as the others at the beginning, too, but appreciating it a lot by the end. SO glad you changed your mind. I LOVE The Horse and His Boy.